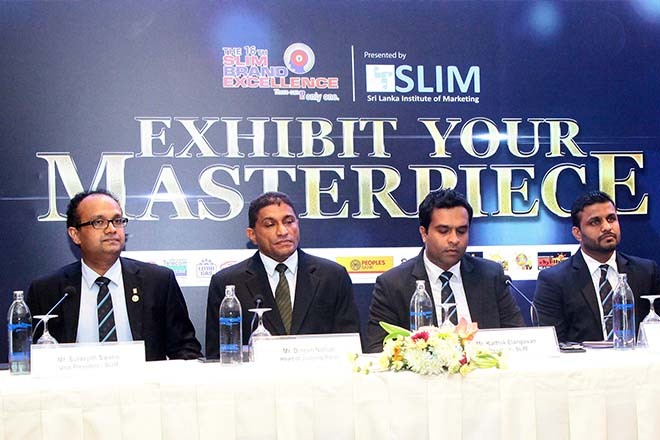 (PRESS RELEASE) – The Sri Lanka Institute of Marketing (SLIM) announced the launch of the 16th SLIM Brand Excellence Awards at a joint briefing held for media and participants at the JAIC Hilton recently. The organizers have fittingly chosen “Exhibit Your Masterpiece” as the theme for this year’s event which seeks to recognize some of the country’s foremost marketers and showcase how they have nurtured greater love for their brands during the year. With the grand award ceremony scheduled to be held at the BMICH in November, SLIM called out to brand custodians around the country to send in their entries before the 25th of August. A series of special workshops will be conducted during the month of August to help participants better understand the criteria based on which their entries would be judged. Contestants will be vying for awards across 13 categories viz. Product Brand of the Year, Service Brand of the Year, Innovative Brand of the Year, Turn-a-Round Brand of the Year, Local Brand of the Year, Best New Entrant of the Year, International Brand of the Year, SME Brand of the Year, CSR Brand of the Year, Export Brand of the Year, B2B Brand of the Year, Regional Brand Recognition Award and Online Brand of the Year. Digital marketing efforts across these categories too will be included in the evaluation process this year. SLIM is looking to actively encourage mobile platform brands to apply under the “Online Brand of the Year” category. The marketing body will also be reaching out to home grown brands of small and medium enterprises, promoting them to apply in the “SME Brand of the Year” category to recognize the efforts of the country’s entrepreneurs. Entries will be reviewed by a preeminent panel of judges comprising some of the country’s most respected professionals with Dinesh Nalliah, Chief Operating Officer (COO), RichlifeDairies Limited at the helm. The Sri Lanka Institute of Marketing (SLIM) serves to produce initiatives in order to encourage strategic and result-oriented thinking in the fields of brand development, sales, advertising and research through events such as the SLIM Brand Excellence, NASCO, Effie and People’s Awards. Often dubbed as the Oscars of the Sri Lankan brand marketing fraternity, the Brand Excellence Awards have the distinction of being the only awards in the country which recognize brands and brand custodians who excel in the area of marketing. The forum also highlights the contributions of Brand Managers towards the success of their brands. This has led to Brand Managers taking great pride and interest in participating in this event. “As members of the marketing fraternity, we are all aware of the pivotal role played by branding in today’s volatile marketplace. Businesses need to build iconic brands that are loved by consumers, now more than ever, to ensure their survival and continued success in the long run. We at SLIM are excited about the awards and urge all brand builders to send in their entries at the earliest and be a part of this year’s event,” said SuranjithSwaris, Vice President – Events, Sri Lanka Institute of Marketing.